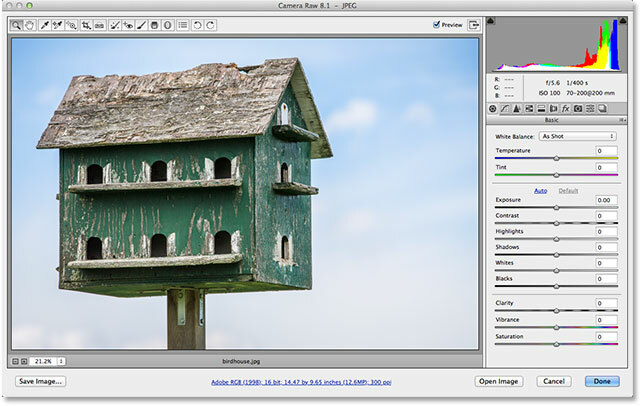 In this tutorial, we'll learn how to crop photos non-destructively using Adobe Camera Raw. We'll be looking specifically at Camera Raw 8, part of the newly released Photoshop CC (Creative Cloud). Camera Raw 8 is also available as a free update for Photoshop CS6 users, and while the CS6 version is missing some newer features exclusive to Photoshop CC, the steps for cropping images in Camera Raw are the same regardless of which of these two versions of Photoshop you're using. As we've learned in previous tutorials, one of Camera Raw's main advantages over Photoshop is that it's a parametric-based image editor, as opposed to Photoshop which is a pixel-based editor. Photoshop makes permanent changes to the pixels in an image, while Camera Raw uses nothing but a series of instructions to display a live preview on your screen of what the image currently looks like based on those instructions. When we make changes to the image using any of Camera Raw's tools or panels, Camera Raw updates the instructions as well as the live preview. This makes working in Camera Raw both flexible and non-destructive because it gives us the freedom to go back and make any changes we want as often as we want without ever harming a single pixel in the original image. As we're about to see, this freedom and flexibility even extends to Camera Raw's Crop Tool so we never have to worry about losing any areas of the image we've cropped away. Where does cropping the image fit within a good editing workflow? Technically, you can crop your image at any time, especially in Camera Raw where everything we do is non-destructive. However, many people prefer to crop the photo as the first step, before worrying about setting the white balance, exposure, and so on. This way, as you're processing the image, you can focus on the area you plan on keeping without any of the surrounding, unwanted area getting in the way. Selecting the image on the left in Adobe Bridge. Clicking the Open in Camera Raw icon. The Camera Raw dialog box. To crop photos in Camera Raw, we use the Crop Tool which works in a similar way to Photoshop's own Crop Tool. There's a few ways to select the Crop Tool in Camera Raw. The quickest way is to simply press the letter C on your keyboard to select it with the shortcut. 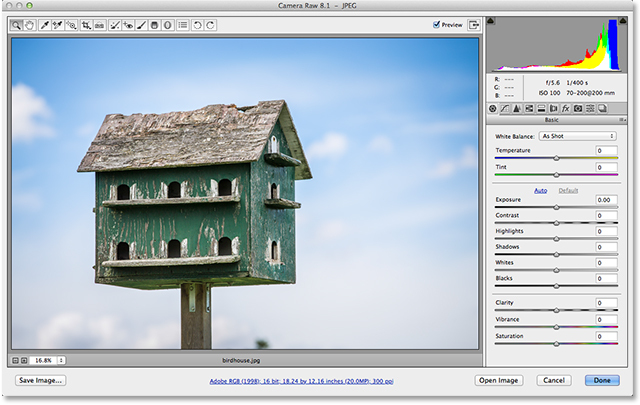 Another is to click on the Crop Tool icon in the toolbar along the top left of the Camera Raw dialog box. However, I don't recommend either of these ways for selecting the Crop Tool, at least not initially, because you're missing out on some useful and important options. The Crop Tool icon in the toolbar. Click and hold on the Crop Tool icon to view its options. Dragging out an initial cropping border. Drawing an initial crop box outward from its center as a perfect square. Click and drag any of the handles to resize the crop box. Clicking and dragging inside the crop box to reposition it. Selecting "Show Overlay" from the Crop Tool menu. Aligning the crop with the 3x3 grid. Click and drag anywhere outside the crop box to rotate it. Use the grid to help straighten a crooked image. Choosing a preset aspect ratio from the list. When cropping to a specific aspect ratio, only the corner handles are available for resizing. Choosing the Custom aspect ratio option. Entering my own custom aspect ratio. The custom aspect ratio is now listed as a preset in the Crop Tool menu. The image after cropping it. Select the Crop Tool again to edit your crop at any time. Choosing "Clear Crop" from the menu. 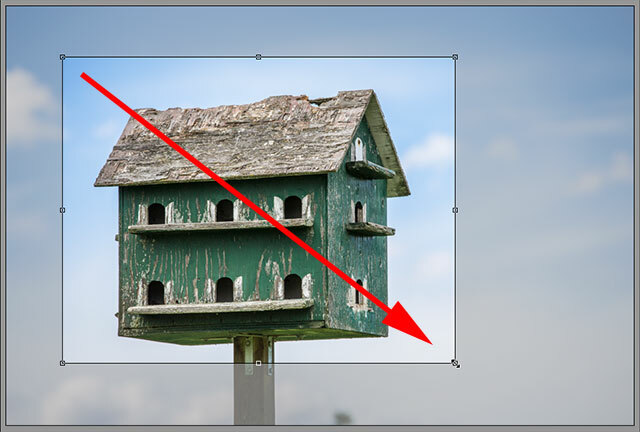 The Camera Raw crop icon in Adobe Bridge. And there we have it! 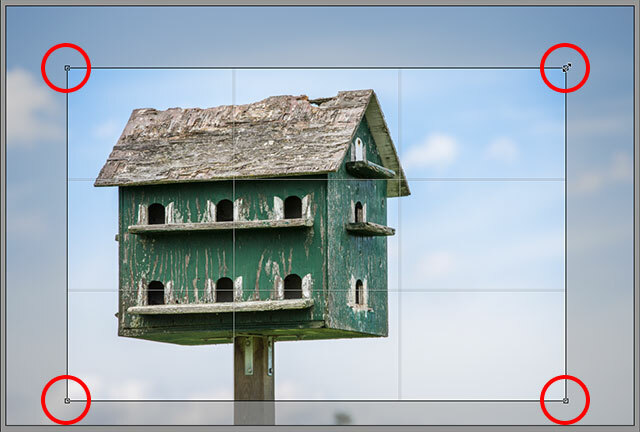 That's the essentials of cropping images non-destructively in Adobe Camera Raw 8, part of Photoshop CC and available as a free update for Photoshop CS6! Check out our Photo Retouching section for more Photoshop image editing tutorials!